You might say that Osprey pilots are neither fish nor fowl. Like the sky-struck Zack Mayo in the 1982 film An Officer and a Gentleman, Brian Smith joined the U.S. military for only one reason: to get jets. Unlike Mayo, however, hovering in Smith's subconscious was an attraction to a radically different flying machine, one he had admired from afar since his days at Wilmington College in Delaware in the early 1990s. What Smith saw in the distance was the New Castle County Airport, where an aerial commotion was under way: Partners Boeing and Bell Helicopter were putting their newfangled vectored-thrust flying machine through its paces. "I'd never seen anything like it," recalls Smith of the V-22 Osprey tiltrotor. "It was like something from outer space." Smith is one of a new category of Marine pilots who will fly and fight with the $69.5 million MV-22 Osprey—in his case, with Marine Medium Tiltrotor Squadron 162 (VMM-162 in naval aviation shorthand). The service has replaced its trusty CH-46E medium-lift tandem-rotor helicopters, predecessors of the Boeing Chinook, with the MV-22, the Marine version of the Bell-Boeing Osprey. The Marines ultimately plan to buy 360 Ospreys for their 18 medium-lift squadrons; the Air Force wants to buy 50 of its own version, and the Navy, perhaps 48. Carrying troops for assault missions is the primary job of a medium-lift squadron, followed by moving supplies and equipment. Though there's a long list of V-22 skeptics, given the unusual aircraft's growing pains since first flight in 1989—a crash in 1992 and two in 2000 claimed a total of 30 lives—pilots like Smith believe it's only a matter of time before converts are made. The tipping point is often the first flight: "I was absolutely amazed," recalls Marine Major John Wesley Spaid of his first flight in the Osprey. Spaid had previously flown tandem-rotor CH-46Es. "The performance was probably the most shocking for me. I was used to 120 knots at 500 feet for the CH-46E. With the Osprey, it's double the airspeed and tenfold the altitude on every flight." Last January, Spaid's squadron, VMM-263, was finishing the last of three training stages in preparation for deployment to Iraq this month, a move that will mark the first test of an Osprey in a war zone. The first stage was the squadron "standup," which included initial training of 24 pilots to fly 12 aircraft, followed by a "maturation" phase, in which pilots learned to work with ground troops and other Marine aviation and logistics groups. The Osprey's pizzazz is the culmination of more than five decades of work by NASA, the military, Bell, Boeing, and other U.S. organizations that had been experimenting with the idea of an airplane-helicopter hybrid. The first serious contender was the Bell XV-3, which flew for 125 hours starting in 1958. Then came the XV-15, first flown in 1977. Bell ultimately built two copies of the XV-15, and NASA and the U.S. Army accumulated 530 flight hours and demonstrated it to more than 300 pilots. The idea was simple in concept: Combine the virtues of fixed-wing and rotary-wing aircraft by mechanizing the twin outboard engines of a medium-size airplane to swivel between the horizontal configuration, called airplane mode, and the vertical orientation—helicopter mode. The Marines were impressed enough to fund 85 percent of the Bell-Boeing contract to produce a prototype (the Air Force funded the rest). 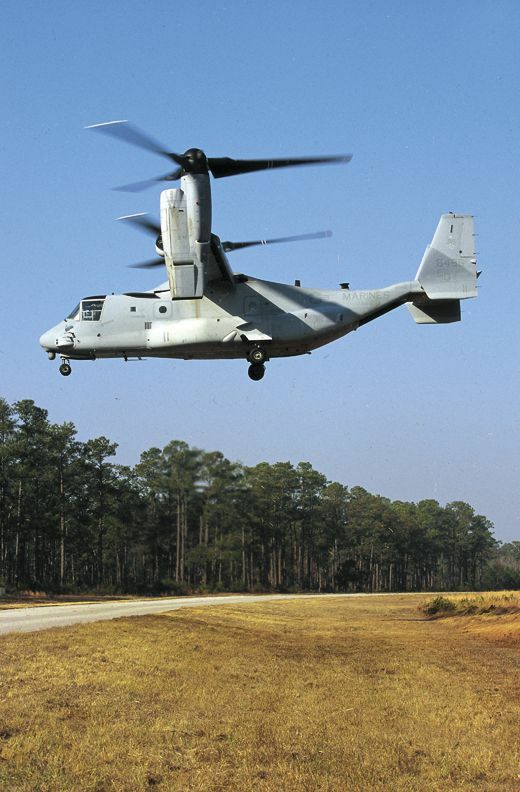 Problems with early Osprey models—software bugs, wire chafing, and "vortex ring state," a loss of lift occurring when rotary-wing aircraft settle into their own downwash—were corrected or adjusted for, and a new Osprey model, called the Block A series, was delivered to the Marine Corps in 2005 to begin training pilots, air crew, and maintainers. The Marines set up the VMMT-204 tiltrotor training squadron at Marine Corps Air Station New River in Jacksonville, North Carolina, to give incoming pilots 50 hours of simulator and 50 hours of flight time in the MV-22 before they headed into the operational squadrons. The squadron teaches basic tactics and formation flight, the first of six levels of Marine pilot training (levels 100 through 600). Deliveries of combat-ready Block B Ospreys began in December 2005. Block Bs included a retractable refueling probe, ice buildup protection, a ramp-mounted machine gun, and other improvements. Smith was largely oblivious to most of the Osprey turmoil in those early years—he had jets to think about. He soloed at age 16 in his dad's 1958 Cessna 172 Skyhawk. After graduating from Wilmington College, Smith did what all future Marine pilots do—he went off for 10 weeks of officer candidate school followed by six months of basic school. He survived the indoctrination and moved on to flight school in Corpus Christi, Texas, flying the Beech T-34C Mentor. Then he was offered a choice: flying the C-130 Hercules transport, helicopters, or jets (the F/A-18 Hornet, AV-8B Harrier, or EA-6B Prowler). No reason to dither: Smith was a jet guy from Day One. The jet route took Smith to intermediate flight training in Meridian, Mississippi, in 1996, during which he flew the T-2C Buckeye, then on to advanced training and his pilot wings with the TA-4 Skyhawk. Soon after, Smith was assigned to fly F/A-18s with a squadron in Beaufort, South Carolina. 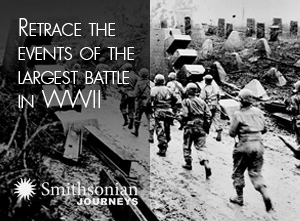 Then Smith went to Expeditionary Warfare School with the Marines in Quantico, Virginia, where he and his classmates had to choose a research project. He selected the V-22. "I was promoting it for the assault support mission, as the future of Marine aviation," he says. As part of his research, his group traveled to the Patuxent River Naval Air Station in Maryland, where Marines were testing the new and improved Block A MV-22s after the crashes of 2000. He "flew" a tiltrotor full-motion simulator and, despite having no helicopter experience, flew it well. He was hooked. "I put in for it, knowing in the back of my mind, back from college, that I thought I might one day be flying it," says Smith. "Sure enough, I got selected." Back then, the Marines weren't sure how tiltrotor pilots should be trained: Should they train in both helicopters and airplanes? A study to determine the best course of action for training tilters indicated that for Smith and other new recruits already trained as Marine fixed-wing pilots, MV-22 simulator time at VMMT-204 in New River would be adequate. All Marine Corps pilots start primary flight training in fixed-wing aircraft, then enter the pipeline to jets, props, helicopters, or tiltrotors. Tilters take multi-engine training in the TC-12B, the military version of the twin-turboprop Beechcraft King Air 200, then an abbreviated helicopter course in the TH-57, the single-rotor Bell JetRanger helicopter. About one-third of today's tilters come from medium-lift helicopter squadrons, one-third are from fixed-wing and heavy-lift squadrons, and the rest are newbies. "Being that the V-22 doesn't have a collective control [a helicopter control for vertical velocity, it governs the pitch of the rotor blades], all I had to do was focus on flying the aircraft," says Smith. "I already knew the gauges, so there was no need to go fly the TH-57." It seemed that tiltrotor controls were similar enough to those of fixed-wing aircraft that fixed-wing pilots could get by without rotary-wing training. A pilots flies the V-22 from the right or left seat using a thrust control lever in his left hand, a device that takes the place of the throttle in an airplane and the collective in a helicopter. In their right hand is the floor-mounted control stick, which takes the place of the yoke in an aircraft and the cyclic control (which governs movement about the pitch and roll axes by tilting the entire rotor disc) in a helicopter. Flight crews include a commander (a pilot with at least 500 hours of total flight time and 100 hours in the V-22) in the right seat, a copilot in the left seat, and a crew chief in the back. A typical flight begins with the ritual walkaround inspection and engine start, a highly automated process that takes about 10 minutes for both engines, says Tom Macdonald, senior Boeing test pilot for the V-22. Takeoff can be made vertically by keeping the two wing-mounted nacelles (each of which contains an engine, two gearboxes, and a three-blade, 38-foot-diameter propeller rotor on top) at the 90-degree angle (vertical), or from a rolling start by "beeping" the nacelle angle toward the horizontal using a spring-loaded rate-control thumb switch on the thrust lever. On the ground, nacelles can be pitched backward to 95 degrees for backing up—like a car in reverse—or tilted forward as far as 45 degrees for taxiing. To take off like a helicopter, Macdonald says the pilot pushes the thrust control lever forward "and the aircraft lifts straight up." The transition between helicopter controls (tilting the rotor disks in various directions to bank, climb, dive, or yaw) and airplane inputs (moving flaperons on the wing and elevators and rudders on the tail) is managed by the triple-redundant flight computers. Macdonald says the process is "effortless" except for the large amount of pitch trim required to maintain level flight during transition from helicopter to airplane mode. The pilot adjusts the trim with a manual control in the cockpit. Once the transition is complete, the Osprey cruises at speeds near 275 mph. To land, Macdonald explains, the pilot pulls back on the thrust lever within a mile or two of the runway. Once the Osprey slows to below 230 mph, the pilot uses the thumb switch to raise the nacelles, first to 60 degrees for the 125-mph downwind leg of the landing pattern, where the landing gear is lowered. Flaps in all modes are handled automatically by the flight computers. On the final approach, pilots beep the nacelles toward the vertical position "three or four degrees at a time," says Macdonald, and land either like a helicopter (nacelles at 90 degrees) or like an airplane, with "run on" or "rolling" landings at speeds up to 115 mph and nacelle angles of 75 degrees or more. Macdonald says the same procedures work if one engine is dead, since both 6,150-horsepower engines share a common driveshaft. For the Marines, a typical flight is a bit more complicated. "Learning to fly the V-22 is easy," says Smith. "Learning to fly it well is hard." That's where training levels 200 through 600 come in. Rock, commanding officer of VMM-263, says a typical day's work for his pilots might include a combination of formation flying, giving paratroopers a lift, ground-skimming night flights on night-vision goggles, aerial refueling, flying from the deck of a ship, hoisting vehicles and supplies, or "fast roping," in which Marines get to the ground by sliding down a rope from the Osprey's open rear deck. Rock previously flew CH-46s with HMM-263 but has been flying the Osprey since early operational testing trials in 1997. Rock, also an instructor pilot for advanced manuevers in VMM-263, says tiltrotor training differs from traditional CH-46 training in that pilots must become proficient in quicker ground operations, like approaching a landing zone, and flying longer-range missions at higher altitudes with aerial refueling, skills that are not an option for CH-46 pilots. As such, Rock says tiltrotor pilots, whether from a fixed-wing or rotary-wing background, take about the same time to complete training: Fixed-wing pilots tend to already have the higher-speed-approach skills down, as well as navigation and control abilities for long-range flights and aerial refueling, but need to become proficient in low-altitude troop and equipment-moving tasks, especially at night on night-vision goggles; helicopter pilots, on the other hand, are generally unfamiliar with the long-range, high-altitude operations. Newbies need all of the above. Lieutenant John Alan Sax was the first of two Marine pilots selected for the Osprey, coming to VMM-263 directly from flight school late in 2004. Sax had wanted to fly since his days as a marketing major at Old Dominion University in Virginia, but he didn't want the fast metal. "I was pretty turned off by jets—I wanted to fly the C-130 transport," he says. "I hadn't heard of the V-22 at that point." Why no jets? "More or less bad rumors," he says. "Even though you're a Marine, you don't get to know your Marines." Sax feels that jet pilots are isolated from the grunts. "I wanted to be a little lower." After his mandatory post-college non-flight Marine training, Sax started flying, first the single-engine Piper Tomahawk for 25 hours, then the T-34C at Corpus Christi, Texas. At that point, Sax and one other pilot candidate for the first time had four options: transports, helicopters, jets, or…tiltrotors. "My ops officer had called me to tell me that I'd be flying the V-22," Sax recounts. Sax thought he'd been selected for the F-22 Raptor, the military's newest single-seat fighter jet, a dream job for practically any other military pilot; oddly, he was disappointed. Sax: "I don't want jets." Ops officer: "No, stupid; it's the Osprey." Path chosen, Sax began flying the C-12, the twin-engine turboprop Beechcraft King Air. During 100 hours of flight training, he learned skills like aerial refueling and low-altitude flying, "building the way forward," he says, "for what we were going to do later with the Osprey." Next it was on to Pensacola, Florida, where he spent 50 hours flying Bell TH-57 helicopters. Focus areas included autorotations (engine-out landings), hovering, and confined-area landings. Sax earned his wings on September 29, 2005, and moved to New River, where he began MV-22 transition in preparation for flying with an operational squadron. Other squadron pilots had transitioned from fixed-wing aircraft, like Smith, or from helicopters, like Spaid. "My original intent was to be a Marine," says Spaid of his time as an undergraduate at Texas A&M University, where he majored in geography. "I had no preference for air or ground." It turned out that the only slot available was for a pilot, and one demonstration ride in a T-2C Buckeye a week later sealed his fate. "I was hooked," he says. In early 2004, after a stint flying CH-46s with the -263, Spaid submitted an Osprey transition request. "I love the -46, but missions could get kind of boring," he says. "You do the same long, slow [missions], day in and day out. With the Osprey, there are a variety of missions you can do in one event—take off as helo, flying high, doing aerial refueling, external loads, and landing as a helo. Time goes by superfast when you're flying [the Osprey]." Smith has similar feelings: "What is truly cool for me is sitting 50 feet above the ground, just hanging there at zero speed, eyeball level with other aircraft. Then I'm 250 knots. That's still a rush."